Another Memorial Day has come and gone, which means another round of celebrities bragging about completing the “Murph” (aka The Murph Challenge), a workout honoring deceased Navy Lt. Michael Murphy and popularized by CrossFit. Murphy was killed in combat in Afghanistan in 2005, and people commemorate his service by doing the Murph every Memorial Day and raising money for the scholarship foundation in Murphy’s name. But perhaps the most impressive Murph-related feat belongs to none other than Donald J. Trump Jr., who claims to have once finished the workout in a blistering 31 minutes and 56 seconds. This is an astounding lie, even for a Trump (but more on that later). Why would the son of a politician lie about something so ultimately inconsequential, especially when that claim can be quickly fact-checked and debunked by the aggrieved, CrossFit bro masses? In that sense Donald Jr. has a kindred spirit with his North Korean counterpart Kim Jong-un. Like Jong-un, Donald Jr. is the son of a national leader — Jong-un’s father, Kim Jong-il ruled North Korea from 1994 until his death in 2011 — and a rising political star in his own right. And both he and Jong-un lay claim to a bunch of dubious athletic feats. So who’s the better athlete — the dadbod-y Donald Jr., or the plump, exquisitely coiffed Jong-un? Let’s go to the tale of the tape and settle this debate once and for all. However questionable Trump’s workout results are, he has the clear advantage in terms of raw physical attributes. Four years after succeeding his father as North Korea’s dictator, Jong-un’s weight ballooned to 290 pounds, or a 90-pound weight gain. In Jong-un’s defense, controlling the least free country in the world has to be a stressful job. But at just 5-foot-7, that’s a rather portly fella. Donald Jr., however, comes in at a relatively svelte 6-foot-1. His weight is harder to pinpoint — this one extremely sketchy site lists it as 165 pounds — but Donald Jr. has kind of a chubby face, so it’s hard to tell. 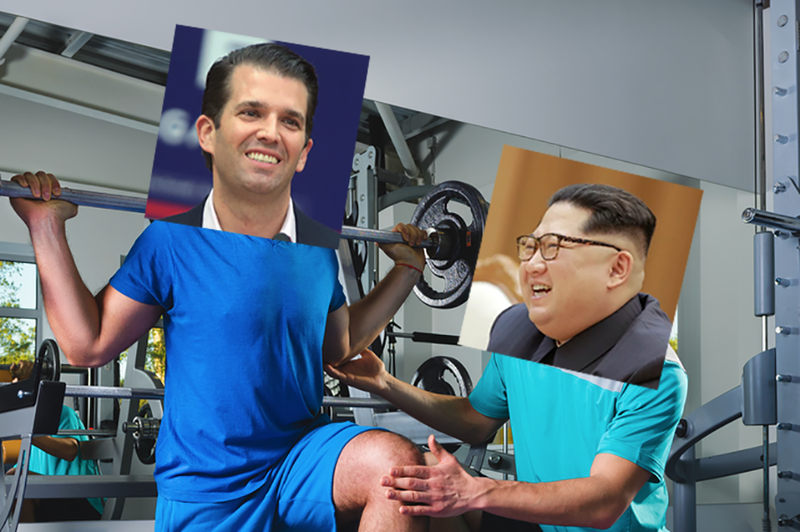 Whatever the case, the bar is low here: Donald Jr. definitely has a more athletic, more impressive physique than Jong-un. Back to Trump’s supposed half-hour Murph time. I currently work out at a CrossFit gym, and a high caliber one at that — several of the members do CrossFit competitively, and there are many more who fall short of that bar, but are still in astounding shape. And even they struggle to finish Murph in less than an hour. That’s just anecdotal evidence, of course. But luckily CrossFitters track their workout performances obsessively, and Donald Jr.’s 32-minute time would place him in the 95th percentile of all CrossFit-doers. It also would mean he was able to cut his Murph time in half in just a month. But for the sake of argument, let’s take Donald Jr. at his word. It’s only fair we do the same for Jong-un, then. And given that, Donald Jr. falls short of Jong-un’s self-proclaimed feats, which include learning to drive at age 3, winning a yacht race at age 9 and scaling the 8,500-foot Mount Paektu in freshly-shined, black leather dress shoes. That, my friends, is true strength. What’s more pathetic: A nickname you give yourself, or one appointed by people who serve you out of fear of death? It’s a tough call, really. Regarding the former, Donald Jr. posted a gym selfie to his Instagram story last week with the moniker Donald Pump. Some truly inspired work there, Donnie. North Koreans refer to Jong-un as the “Shining Sun,” which is extremely cool and chill and reminiscent of “The Sun King” Louis XIV of France, history’s other great maniacal, murderous, heliocentric dictator. Donald Trump Sr. may be an avid golfer, but skills on the links pale in comparison to Jong-il’s, who, in his first and only ever round of golf, recorded 11 holes-in-one and a score of 38-under par. Breathtaking. Jong-il was similarly preternaturally gifted at bowling — he scored a perfect 300 the first time he ever played. President Trump is a measly 2.5 handicap, by comparison. He’s been known to shoot in the low 70s, according to Lindsey Graham, and has even once posted an impressive score of 68. But Jong-il died at age 70, whereas Trump is still going strong at 71. And anyone who is in “astonishingly excellent” health at that age despite a junk food diet and a noted fear of exercise is impressive. Look, both families are obviously a bunch of lying liars when it comes to health claims, but the Kims’ are so outrageous as to be fun and enjoyable, whereas the Trumps’ maintain enough of a tether to reality as to be somewhat believable, and therefore, much more insidious. That said, Trump Jr. is more athletic. Jong-un probably gets tired climbing a porch stoop. Either way, when you can be reasonably lumped in with a dictator, it’s always a bad look. Almost as bad as the technique on this deadlift.